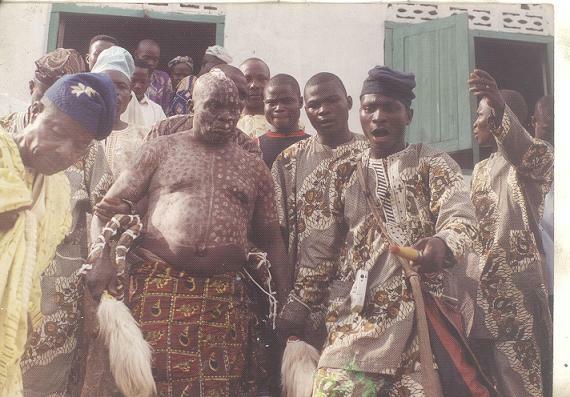 During this festival the Araba Agbaye is transformed into a leopard and marches to the palace of the Ooni. 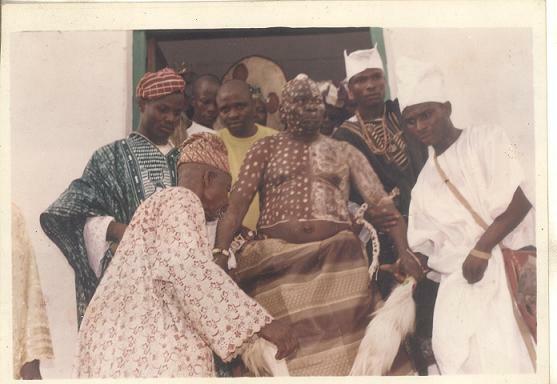 Araba Agbaye during Odun Elefin ceremony, his son Babalawo Owolabi Aworeni featured on the far right. 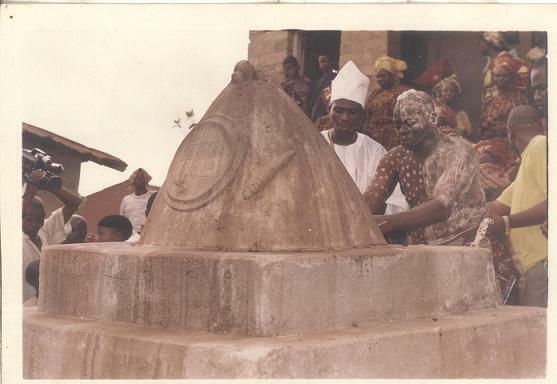 Araba Agbaye during Odun Elefin ceremony touching Origi, his son Babalawo Owolabi Aworeni featured on the left. Araba Agbaye during Odun Elefin ceremony next to Origi, his son Babalawo Owolabi Aworeni featured on the far left. 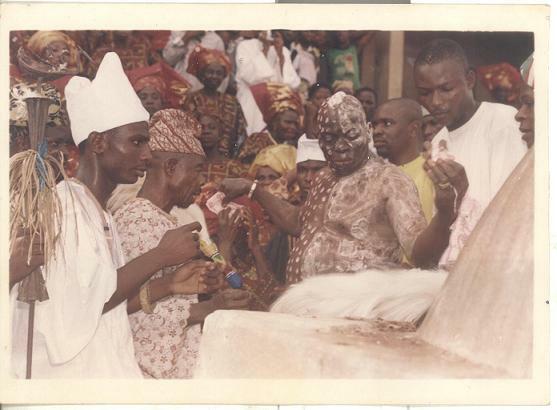 Araba Agbaye during Odun Elefin ceremony, his son Babalawo Owolabi Aworeni featured on right. Ela moyin Aboru,moyin Aboye, moyin Abosise, giving honor to Olodumare, Ifa, Ori Isese, Irunmole, and Egungun Nla the web page is beautiful and a great honor to our family to have you worshiping and working in the world as a beloved priest of Ifa. I know that your parents are proud as like your brothers and sisters for you to are contributing greatly to the education, spirituality, and edification of Ifa in the world. It is my prayer as always that Ifa continue to bless you as It has done so for the entire Aworeni lineage. May you have all the peace, love, joy, and prosperity that Olodumare can give to you. These images are fantastic. Truly a rare pleasure for us in the U.S.
Aboru Aboye, Baba wa Chife Araba Aworeni Awoyemi Adisa Mokanrawale,Oluwa yio lora emi yin ami,Ase o!!!!!!! Aku ipalemo Odun isese Agbaye yio ba gbogbo wa ni ayo ati alafia,Pataki Oro mi ni wipe gbogbo Awa omo ile karo ojire ti aun be loke okun ki yin fun ise takun takun ti ori ero gbohun safefe,Igba Irunmale yio tun bo ti yin lehin,Igba Odun, Odun Kan ni gboingboin loke oke gboigboin,Odun yio yabo o!!!!!!!!!!!!!!!!! Agradecido por la creación de esta página que viene de manos de personas vinculadas a Baba Araba Aworeni Awoyemi Mokanrawale Adisa, descendiente de Baba Orunmila. Con este aporte en la web se estaran uniendo todos los continentes en uno solo donde se proclamará la palabra de Orunmila a tarvés de IFA. aboru aboya abosise Been thankful by the creation of this page that comes from hands of tie people to Dribble baba Aworeni Awoyemi Mokanrawale Adisa, descendant Orunmila Dribble. With this contribution in the Web you would be estaran uniting all the continents in one single one where the word of Orunmila to tarvés of IFA will be proclaimed. Very beautiful website keep up the good work!!! Been thankful by the creation of this page that comes from hands of tie people to Dribble baba Aworeni Awoyemi Mokanrawale Adisa, descendant Orunmila Dribble.from Venezuela. ogbo ato asure iwori wofun. NEVER BEFORE HAVE I SEEN THE FESTIVAL HIGHLIGHTED IN SUCH EXPLICIT FORM,IT IS WHEN ONE EXPERIENCES GOING TO IFE FOR THE FESTIVAL,THAT ONE CAN SURELY RELATE,THE EVENTUAL UNFOLDING OF EVENTS,THE EXPLAINATIONS,THE PICTURES,THIS IS GREAT,OLODUMARE ASE.CONTINUE THE WONDERFUL WORK YOU ARE DOING.MAY OLODUMARE ORISA AND ANCESTORS CONTINUE TO GUIDE YOU AS YOU SEEK TO BRING ENLIGHTENMENT TO THE WORLD.ASE.IREOOOOO OGBO ATO ASURE IWORIWOFUN. I have read each article on this website and find all of them to be quite informative and well-executed in their language and imagery. The lessons I have learned from each posting have been absorbed into my spirit with gratitude. Babalawo Owolabi Aworeni, I give you respect for this effort. Blessings to you and to the Araba Agbaye. You actually make it seem so easy along with your presentation but I in finding this matter to be really something which I believe I would never understand. It seems too complex and very broad for me. I’m having a look forward to your subsequent put up, I?ll attempt to get the hold of it! Boa idéia da criação do site. A cultura muito bem organizada, para todos terem acesso. O mundo precisa disso de mais amor e cultura e respeito. Paz ! Helpful info. Fortunate me I found your site by accident, and I am shocked why this twist of fate didn’t came about earlier! I bookmarked it. Its such as you read my thoughts! You appear to know so much approximately this, like you wrote the e book in it or something. I feel that you just can do with some p.c. to pressure the message home a little bit, but other than that, that is fantastic blog. An excellent read. I’ll certainly be back. I’ve been browsing online greater than 3 hours today, yet I by no means discovered any attention-grabbing article like yours. It’s beautiful worth sufficient for me. In my opinion, if all webmasters and bloggers made excellent content material as you did, the internet might be much more useful than ever before. Aboru Aboye Abosise Araba Agbaye Awoyemi Adisa Aworeni Makoranwale – Ese O – Seeing this site is a blessing – It brings good memories of my time in Ile Ife during 2009 Festival – My heart is filled with much joy of the experience – I pray to attend again in the future – Much love and blessings of Olodumare ati Egungun ati Orisa. I will be back to this site often. Ireally l love our African tradition,the way it been organised and celebrate.The gods will, preveit, is powers. to visit the web page, that’s what this website is providing. Wonderful goods from you, man. I have bear in mind your stuff prior to and you’re simply extremely wonderful. say it. You’re making it entertaining and you continue to take care of to stay it wise. I can not wait to learn much more from you. This is actually a tremendous web site.